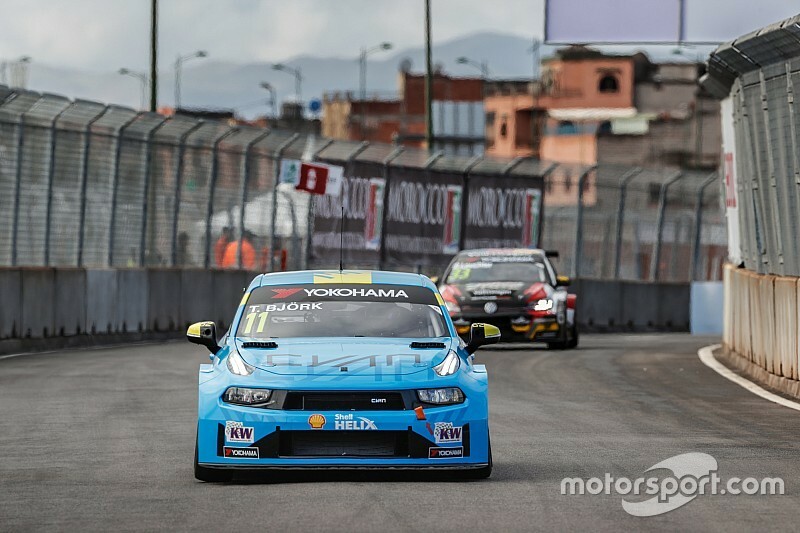 Thed Bjork put Cyan Racing's new Lynk & Co 03 on top in practice for the World Touring Car Cup season opener in Marrakech. 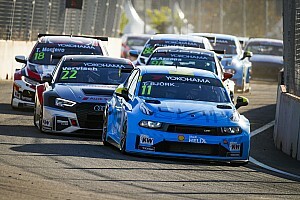 Bjork, the 2017 World Touring Car Championship title winner, set a best time of 1m25.308s in the shorter second session at the Moulay El Hassan street circuit. Despite air temperatures hovering at around 12C, sunshine before FP2 helped dry out damp spots that had remained after first practice, and it took WRT's Jean-Karl Vernay less than 10 minutes to beat Aurelien Panis's 1m25.841s benchmark from the first session. Reigning champion Gabriele Tarquini spent much of the first half of the 30-minute session in the pits, but vaulted his BRC Hyundai i30 N to the top of the times with a 1m25.625s. That effort was beaten by Tiago Monteiro, Tarquini's BRC stablemate Norbert Michelisz and Esteban Guerrieri, before Bjork hit the front by going a tenth and a half faster than the Munnich Motorsport Honda Civic Type R.
The session was stopped with four and a half minutes left on the clock when Tom Coronel briefly came to a halt on track after his front-right tyre went down at the first corner - a minute or so after Gordon Shedden had also suffered a puncture at the same spot. But Coronel got going again and was able to limp his Comtoyou Cupra back to the pits, allowing drivers one final attempt at a fast run. Guerrieri looked as though he might trouble Bjork's top spot with a fastest first sector of all on his first flying lap back out on track, but ultimately backed out of that effort. The Argentinian did go faster on his final run, but an effort of 1m25.402s left him 0.094 seconds down - meaning Bjork, who took pole for the opening WTCR race in Marrakech last season, ended FP2 on top and within a second of Tarquini's qualifying lap record. Bjork's Cyan team-mate Yvan Muller jumped up to third late on in his Lynk & Co 03, a further 0.038s back from Guerrieri, while Norbert Michelisz was the fastest of Hyundai's contenders in fourth. Monteiro made a strong start to his first weekend back in World Touring Cars on a full-time basis by going fifth fastest in both sessions in his KCMG Honda. Tarquini's early benchmark time was good enough for sixth in the final FP2 order ahead of Yann Ehrlacher - whose mirror fell of and had to be collected by marshals under a full-course yellow in FP2 - and Panis (Comtoyou Cupra), who had earlier beaten Vernay and the Lukoil-backed BRC Hyundai of Nicky Catsburg to top spot in FP1. The PWR Cupra of Mikel Azcona and Vernay's Audi RS3 LMS completed the top 10 in the faster second session, with both within half a second of Bjork's time. Rob Huff was again fastest of the Volkswagen contingent in 11th in his Sebastien Loeb Racing Golf GTI, one place ahead of where he ended FP1, while Kevin Ceccon put Team Mulsanne's lead Alfa Romeo Giulietta Veloce 13th after ending FP1 in 21st. 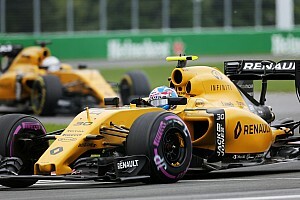 As pre-season predictions suggested, the field spread was incredibly tight; 18 cars were separated by a second in first practice, while all but three of the 26 drivers were in that bracket in FP2. Three-time World Touring Car champion Andy Priaulx was the final driver within a second of Bjork in FP2, reporting on his final run that he had "a bit of play in the first part of my brake pedal" in his Lynk & Co 03.